Hello nubbins, my old friends... That's right, my nails broke again. :( It probably has to do with stress and not taking care of them properly. But today I decided: "Nub nails aren't enough to keep me from blogging!" So here I am! 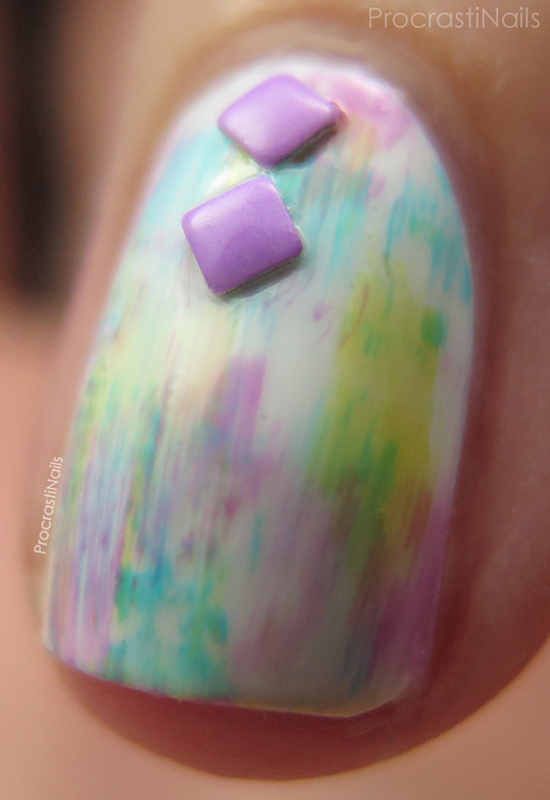 Check under the cut for a better look and a run-down of the polishes I used today! I started with a base of Essie Blanc - the Silk Watercolors line came with it's own base but it just looked like another plain white so I passed on picking it up. I haven't looked into it though, so if it's not just a plain white someone should let me know! Haha. Once my base was dry I did a quick and simple dry brush look using three of the Silk Watercolors - Muse, Myself (a yellow), Pen & Inky (a deep turquoise) and Highest Bidder (which looked like a deep maroon but came out as a pastel pink)! There is a true pink in the collection (Love Sheen) so I'm curious to see how that will compare! I finished it off with some studs from Born Pretty Store (if you want to pick up something similar you can use my code ASZW10 for 10% off) to add a bit of an extra something-something. I love a good dry brush look and the Silk Watercolors are perfect for the technique. They leave a wash of colour that seems a bit more sheer than the OPI Color Paints (which is awesome because it means I won't regret buying both collections!). So dreamy looking! The added studs look great. Your nubs are freaking adorable! Definitely glad you decided to blog with them. Love the mani. Love the addition of the studs! Your dry brush nails look awesome! These are so pretty!! I love the colors! 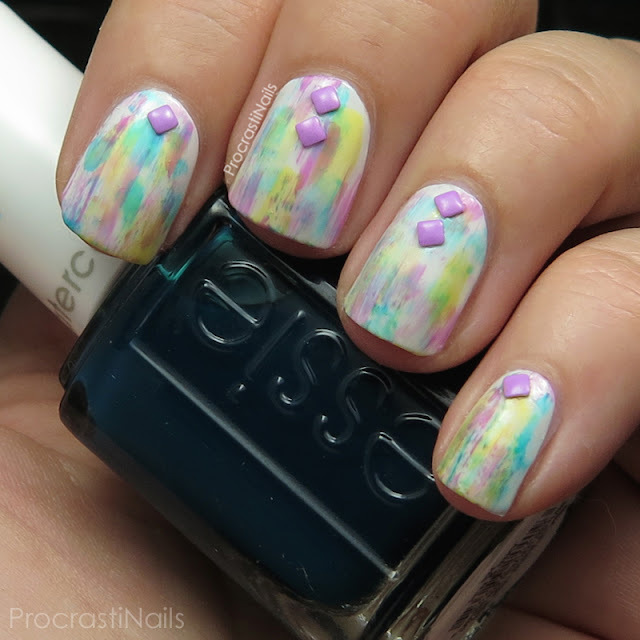 I love brushstroke manis but I haven't used any sheer polishes for one yet, something I need to remedy. I love the look you did, the studs set it over the top. 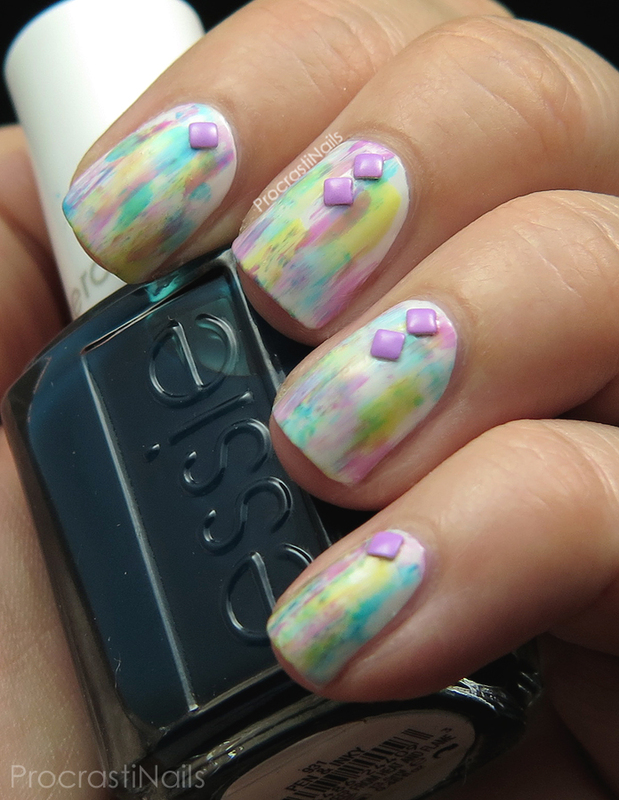 Beautiful work, and studs complement it nicely, I was thinking to get either OPi or Essie, which one did you like more? I love these pastel colours! Gotta check this collection, I completely missed its release to be honest. I am waiting on the two mini sets of these to show up! Love that you added the studs! So pretty!